All of the major cruise lines have loyalty programs. Most also have onboard receptions to thank guests for cruising with that line again. A standard feature at these parties is the moment when the captain and the loyalty manager recognize the guests who have sailed the most with that line. The guest(s) who receive this recognition are known by various names - - top sailor, most traveled passenger, senior guest. Having traveled with Cunard over 100 times since 1967, I have been the top sailor on several voyages. Cunard Line has a very loyal following. Guests often come back time after time. Ships such as Queen Mary 2 and Queen Elizabeth 2 have international reputations and unique atmospheres that call guests to come back. For many, a crossing on Queen Mary 2 is the preferred way to travel between America and Europe and so they take that ship regularly. In addition, the three Cunard ships usually do extended world voyages each winter. Quite a few guests repeat these voyages each year and thus accumulate large number of cruise days. There are guests who have sailed with Cunard for literally thousands of days. Except on short sailings, there is a Cunard World Club reception on each voyage. Because of the number of guests entitled to an invitation, these receptions are usually held in the large ballrooms that are a hallmark of the Cunard ships. At the close of these receptions, there are a number of speeches by the captain and the loyalty managers who double as future cruise representatives. The speeches usually include such things as the number of guests on the voyage who are in each of the loyalty levels and remarks about upcoming itineraries. On Queen Mary 2, which has some 24 kennels, there is also mention of the cainine passenger who has the most days at sea. However, that honoree usually does not dain to attend the reception. 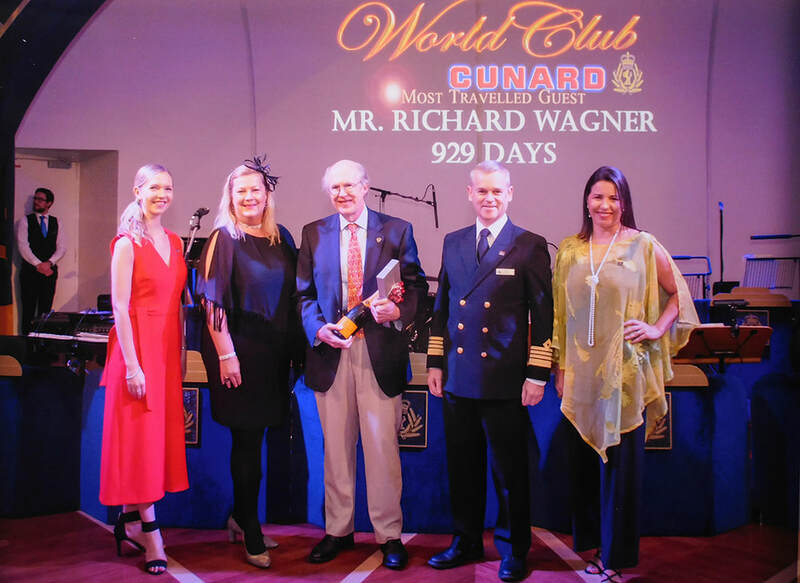 The speeches lead up to a countdown of which guests have sailed the most days with Cunard. Usually, the second and third place guests are announced and they stand and wave to the crowd. Finally, the top sailor is announced and brought up to the front of the room to shake hands, receive gifts and have a photo taken. The announcement is not a surprise to the winner. A few days before the reception, one of the loyalty managers calls the guest to inform him or her that he or she is the most traveled passenger on this voyage. The loyalty manager then asks if the guest would like to be recognized at the World Club reception. A guest can decline and sometimes do decline. In such cases, the guest with the next highest number of days is honored. To avoid too much repetition, a guest doing a number of back-to-back voyages can only be recognized once during the time he or she is onboard. Thus, a guest combining two cruises will only be recognized as top sailor during one of the two cruises. ​Before announcing who is the top sailor, the loyalty manager makes a few remarks about the guest. In order to enable her to do this, she meets with the guest and asks questions such as what is their favorite Cunard ship and what is their favorite port of call. As might be expected, the loyalty manager usually knows the guest and she might include a personal memory in her remarks. The idea is to give the presentation more human interest. If the guest so desires, the loyalty manager will reserve a table by the dance floor for the guest. This way the guest does not have to cut through the crowd when his or her name is announced. There is a printed sign with the guest's name on it and “most traveled passenger,” which makes for a nice souvenir. When your name is called, you walk across the dance floor, which always seems larger than it did before, to shake hands with the captain and often the entertainment director. The loyalty managers hand you gifts. Then everyone gathers for a photo by one of the ship's photographers. Your name and the number of days traveled appears on the screen over the bandstand. There is applause from the crowd. It all happens in a few dizzying minutes. The gifts include a bottle of real champagne, i.e. not sparkling wine. There is also a small gift such as a clock or a leather case for carrying travel documents. The Cunard name is engraved or embossed on the small gift. They are always tasteful and good quality. After the presentation, a number of guests come up to speak to you. They ask about such things as the places you have traveled, whether you have ever done a world cruise and the changes in Cunard over the years. Sometimes someone who sailed with you on a voyage long ago will come up to renew the acquaintance. Do you ever sail with other cruise lines? Yes. I am in the top tier or next to the top tier of the loyalty programs at most of the major cruise lines. However, I have sailed on Cunard the most. It is a matter of personal taste. I find that the sophisticated atmosphere aboard the ships suits my tastes. The enrichment programming - - the lectures, the Royal Academy of Dramtic Arts troupe, the movies - - is intellectually stimulating and makes the sea days on the Cunard ships something special. In addition, each voyage on Queen Mary 2 has something different; perhaps it is a concert by ﻿Crosby, Stills and Nash﻿; the events of Transatlantic ﻿Fashion Week﻿; ﻿song writing﻿ workshops with professional recording artists; a spectacular meeting of the three Cunard queens celebrating a Royal Jubilee ; or a rescue at sea. Each voyage is memorable. I also admire QM2 as an ocean liner. Technologically, she is something quite different. (Much of the above can also be said for Queen Elizabeth 2, which is no longer in service but which I sailed on many times). Do you do world cruises? No. I have done segments of world cruises but never a complete world cruise. My mainstay at Cunard is the transatlantic crossing. However, I have also done Cunard cruises in Europe, New England/Canada, Bermuda and the Caribbean. What is the biggest misperception about Cunard? People often think that the Cunard ships are two class ships and that they will be confined to steerage like the hero in the Titanic movie. However, any passenger can go just about anywhere any other passenger can go on QM2. The passengers sailing in certain suite restaurants do have their own restaurants (the Queens Grill and the Princess Grill) and an adjoining lounge. However, the same is true for the most recent ships sailing for Norwegian Cruise Line, Royal Caribbean International and Celebrity Cruises. Yet people do not regard those ships as two class ships. Has Cunard changed since it was acquired by Carnival Corporation? Yes. Carnival saved Cunard. Prior to the acquisition in 1998, it looked to all concerned that Cunard was about to go out of business. Carnival stepped in and infused capital. It also gave Cunard the direction and identity which it had lacked during the last part of the 20th century by focusing on the line's long tradition of transatlantic travel. Carnival enabled QE2, which was by then quite old for a passenger ship, to sail for another ten years. Carnival also built a new ocean liner, QM2, at an extraordinary cost over and above the cost of building a comparable size cruise ship thus ensuring the continuation of regularly scheduled transatlantic crossings. It also added two modern cruise ships to Cunard. What would you change at Cunard? I would add another tier to the loyalty program. The perks are the same if you have done 15 cruises or 115 cruises. In recent years, several of the major cruise lines (Royal Caribbean, Norwegian, Carnival Cruise Lines and Celebrity) have recognized that it is appropriate to have a separate tier for those passengers who have traveled with them an extraordinary number of times.